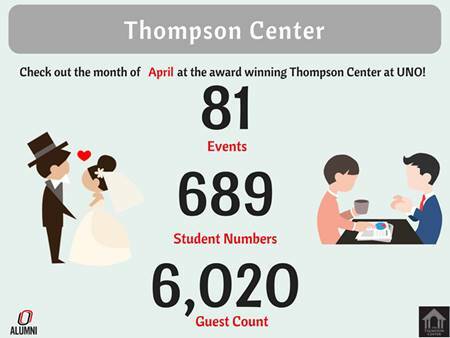 For 35 years, the Thompson Alumni Center has been one of Omaha’s most popular meeting spots. With eight versatile rooms, the center is a popular Omaha conference, gala, wedding ceremony, and reception venue. Offering nearly 10,000 square feet of accommodations in which to host a variety of events. We engage and serve our guests, welcoming thousands in the Omaha community to the UNO campus for a wide variety of events. 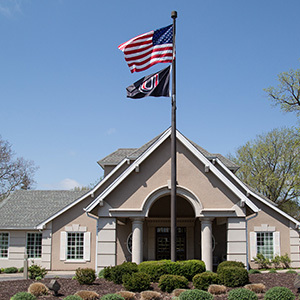 Features include shaded, landscaped grounds, midtown location, a modern and welcoming environment, in house audio & visual technology, professional on-site staff, free parking, and incredible catering. Located at the corner of 67th Street and Dodge St., our landmark building is named after William H. & Dorothy Thompson. William H. Thompson led the university for over half a century in a variety of positions including president of the UNO Alumni. 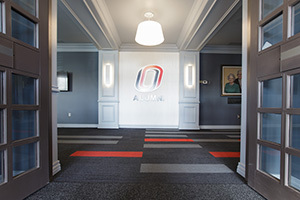 Because of the dedication and passion of so many UNO Alumni, the Thompson Alumni Center stands as a statement of the power of the Maverick spirit. The Thompson Alumni Center team members operate on the premise that our performance and commitment to your occasion is the highest of priorities. The award-winning Thompson Alumni Center has been voted the Best of Omaha reception venue and Omaha Magazine Business 2 Business best banquet facility 2015 through 2017, including being named Omaha World-Herald Choice winner for wedding reception venue in 2016-2017. Our pricing structure is straight forward and sensible with no hidden extras. We make choosing the Thompson Alumni Center worry-free and provide you with the freedom to make your event extraordinary. Six-time Best of Omaha winner Catering Creations is the Thompson Alumni Center’s exclusive caterer. Catering Creations provides expert event planners to assist you from start to finish, making your event one to remember. We look forward to meeting with you to introduce our caring, outstanding team while sharing our remarkable and versatile space. You don't have to be a UNO Alumnus to reserve a space! Give our team a call today to schedule a tour.